This disc was another learning experience for me for, though I knew the composers’ names, I knew nothing more apart from Goldmark’s Violin Concerto and his Rustic Wedding Symphony (Symphony No.1). What I learned, first of all from the booklet notes, was that as Jews each of the three composers suffered, as was so often the case in our intolerant world. Their works were banned under the Nazis and Gál and Zemlinsky were forced to flee abroad. Dying in 1915 Goldmark was at least spared the upheavals caused by the Second World War. Born in Keszthely on Lake Balaton, Hungary, Goldmark was one of over twenty children of a cantor. With twelve of the children surviving, life was extremely poor for the family. It is surprising that somehow Goldmark was able to study music, first in Sopron then in Vienna. To make ends meet he became a music journalist who was renowned for his even-handed treatment of Wagner and Brahms in a world that was divided into two opposing camps, each viewing the other with suspicion. Goldmark became friendly with Brahms though Goldmark kept him at arm’s length due to Brahms’ prickly personality. Goldmark’s reputation hangs mainly on the above-mentioned Violin Concerto and Symphony, his chamber music still remaining relatively unknown. On the evidence of this piano trio, Amicably dedicated to Pablo de Sarasate, this situation is undeserved. It is to be hoped that this disc will help rectify it. The work was written in 1879 at the height of his career following the great success of his opera Die Kőnigin von Saba (The Queen of Sheba). Cast in four movements the piano trio is a joyous work with some very beautiful tunes, a feature that distinguishes all three of these trios. It opens with a clearly stated and memorable tune introduced on the piano before the other two instruments join in. It is passed from one to the other to be worked on and the whole is an exemplary demonstration of the sort of chamber music interplay that characterises the best compositions of the genre. Each movement has at its centre an achingly heartfelt tune, including the scherzo that is otherwise lighter in tone than its surrounding movements. I’ve read that Goldmark had little sympathy with the piano. This is surprising when the piano writing in the trio is taken into consideration as it is excellent, as is the writing for the violin and cello. That said, just as there are only a few solo piano pieces and no piano concertos there is but a single string quartet. Hans Gál’s Piano Trio dates from 1949 though you’d be hard pressed to guess it from the writing. It is as unashamedly romantic as are the other two. Again, as with Goldmark’s work, this is joyful music that exudes light-heartedness at every turn. Though it lasts a mere eleven and a half minutes it incorporates an extremely successful set of musical statements that are clearly expressed and well developed. This short work is chock full of the most beguiling tunes and is as charming and enjoyable a piano trio as you’re ever likely to hear. Knowing nothing about Gál I looked on the internet and discovered a really interesting and informative Personal tribute and memoir by Margaret Moncrieff Kelly from 2003 and an article by Guy Rickards entitled Three emigrés: Gál, Gerhard and Goldschmidt, originally written in 2001, and subsequently updated at various times - both of these are to be found on MusicWeb International. These two pieces are fascinating and highly informative. They also reveal that little was known of Gál’s music here in the UK his adoptive country - he lived almost half his life in the UK, in Scotland - at the time, which was a scandal. In the 2001 article Rickards informed us that only three works were available on record - how shameful! Looking at the situation now there are over forty discs on which you can find works by Gál, a vast improvement and one that will inspire me to discover more. The present recording of the Piano Trio is not the first so things are definitely looking up, thank goodness. Alexander Zemlinsky’s Piano Trio dates from 1896 and is another discovery for me. This is late romantic music on a grand scale, full of rich and gorgeously melodic tunes. The title of the booklet’s article is A Leitmotif called Brahms because it is Brahms who is, in a sense, the linking figure in these three trios. As noted at the start, Goldmark knew Brahms and admired him as did both Gál and Zemlinsky. Gál was responsible, along with his teacher Eusebius Mandyczewski, for editing ten volumes of Brahms works. This has become a standard reference resource for scholars. On one website people who regret that Brahms didn’t write enough piano trios are directed to hearing the trio on this disc. Zemlinsky, interestingly, actually had his trio performed in a competition at which Brahms was one of the judges. He received third prize though the works that came first and second are no longer known or performed. Another interesting fact about that trio is that it was originally written for the unusual combination of piano, clarinet and cello, an obvious link to Brahms’ Trio, Op.114, written only five years previously and only otherwise used by Beethoven in his Trio, Op.11 (Gassenhauer Trio). I read on another website that the Zemlinsky piano trio doesn’t particularly sounds Brahmsian. I beg to differ - just listen to the opening bars with its main theme that recurs again at the trio’s close, and see what you think. While I don’t believe that any of the three composers were in any way attempting to sound like Brahms it is perhaps inevitable that admirers of a composer to the extent that these three admired Brahms were bound to sound something like their idol. Even if they were unaware of it, the trios are all certainly closer in musical terms to Brahms than they are to Wagner of whom they also thought highly. In the end the only valid argument is in the ear of the listener; I for one loved all three. The music is played with huge passion by these three musicians. 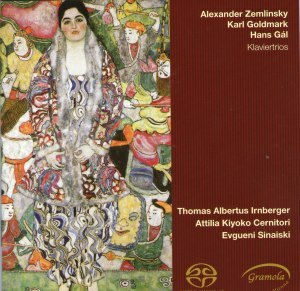 I hope that they will record more by other less well known composers who like the Goldmark, Gál and Zemlinsky deserve wider exposure. This is a disc of wonderfully passionate and beautifully melodic music. It does great service to these three great composers whose works are slowly becoming better known … and not before time!